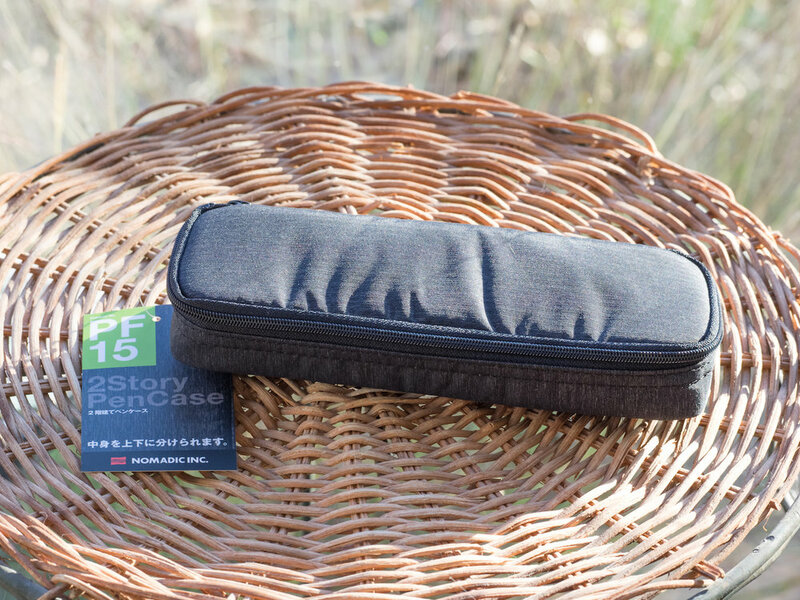 The Nomadic PF-15 2-Story Pen Case is a padded, zippered pen and art supply case. The outside of the case is made of nylon and polyester with a woven, heather-like look. The case has two zippers for easy opening and closing. 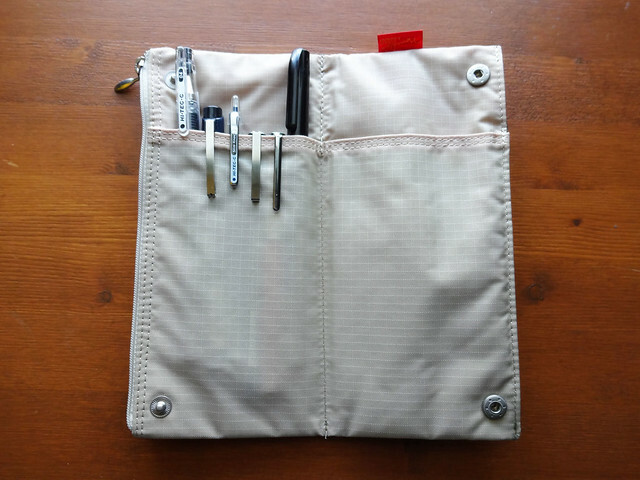 Inside the top flap is a webbed pocket that is perfect for a small ruler, flat scissors, or pens and pencils. The main compartment consists of two parts. The first “story” can hold several pens plus there’s a pop-up pocket for an eraser or small pencil sharpener. You can also press the pocket flat to accommodate larger objects like scissors. The second “story” is a flap with three elastic pen/pencil holders. This allows you to put certain pens or pencils on top for easy access. Overall, I like the design of this case. The bottom compartment can hold ten or more pens (ballpoint, rollerball, gel, or highlighters), and the top flap sets apart three pens or pencils for easy access. The mesh pocket in the top is perfect for flat items like a ruler, though you could certainly put more pens there. However, I’m not so fond of the pop-up pocket. It is useful to hold an eraser or a small pencil sharpener, but it doesn’t really lie flat when it’s not in use, so it just seems to get in the way. I wish the top flap held at least four pens (there’s plenty of room for one more slot). I also think that the flap should be longer so that it completely protects the pens or pencils from the supplies underneath. Because the flap is short, any pens in the slots will knock against the pens/pencils underneath, which could lead to scratches. It would also be helpful if the flap was detachable so you could have easier access to the pens in the bottom compartment. As it is, you have to hold the flap out of the way to access the pens in the bottom compartment. I do not recommend this case for fountain pens. The elastic loops in the pen flap are fairly tight and will accommodate only the slimmest fountain pens. More importantly, because the flap is short, your pens will hang over by about an inch or so, leaving them exposed to any pens or supplies underneath. For regular pens, pencils, and art supplies, this pen case will work well. It is small enough to fit in purses and backpacks, and the nylon/polyester exterior should stand up to all sorts of abuse. You can purchase the Nomadic PF-15 2-Story Pen Case from Jet Pens in either black or navy blue for $19.00. Posted on December 1, 2017 by Susan Pigott and filed under Nomadic, Pen Case. In my quest for the perfect bag, the most common criticism I have is "not enough pockets", so when I saw the plethora of pockets on the Nomadic Biz Comp Brief Tote, I swooned a little. The product description says 8 pockets, but if you count the interior and side pockets, it's actually fourteen. FOURTEEN. On the front of the bag, there are four zippered pockets. The bottom two are deeper and easily fit smaller notebooks or planners, pen cases, or even small tablets. 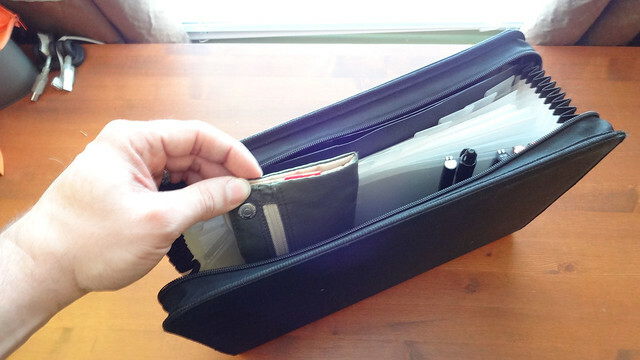 The top two are more shallow, but easily fit several pocket notebooks, or phones, keys, or a wallet. On either end of the bag are tall, narrow zipper pockets treated with polyurethane. These are perfect for a small water bottle and umbrella--or, if you go the diaper bag route, they're great for bottles or sippy cups. They're waterproof and isolated from the other compartments, so no condensation or spills reach your other items. The top of the bag is also polyurethane. Set into the top edge are two small zip pockets. They're just deep enough for a pocket notebook, phone, iPod, or wallet. They're very handy for anything you might need to grab quickly. Between these small pockets is the main compartment. It is one large space with no internal pockets. It's large enough to fit a 14" laptop, plus a few A4 notebooks or a textbook. On the back of the bag is another zip compartment big enough for file papers or more notebooks, and inside that are four pockets in a stretchy padded foam. They're all different widths, from narrow enough to hold a few pens to wide enough for a pocket notebook. (I'm uncertain at this point if "pocket notebook" is my new favorite unit of measurement, or if this bag was just made for pocket notebook fanatics. Possibly both.) There are no individual pen pockets, so if your pens can't touch, you'll need to use one of the other pockets for a pen case. So, four on the front, plus two top, plus one main, plus two sides, plus one back, plus four interior equals fourteen. You know what? This bag has enough pockets. It's the ultimate notebook vehicle. Maybe even the notebook clown car. The materials are good--sturdy and practical. The Cordura nylon may outlive us all. I'm unsure about the longevity of the polyurethane--I've had similar materials crack or tear on other bags. The rest of it is so well made that I wonder if including this material, as useful as it is, shortens the lifespan of the bag. Only time will tell, there. Alas, the materials only come in boring (though nice) colors: navy, wine, and black. The zippers (of which there are ten, guys, TEN--and not a scrap of horrible velcro anywhere) operate smoothly and come with nice cord-and-toggle pulls. The stitching is strong and even. The bottom of the bag is reinforced with rigid plastic and has five metal feet. The strap has swiveling clips that attach to plastic D-rings and can be removed if you want to carry the bag by the briefcase handles. The strap is adjustable and has a ventilated foam cushion. Despite all these durable materials, the bag is surprisingly light. Until, that is, you fill all fourteen of those pockets. And that's where this bag stops being my daily carry. After a joyful pocket-filling frenzy, it's just to big and heavy for me to carry around all day. If it had backpack straps, or if it was slimmed down just a little--maybe scaled down to 12" laptop-size, that might do the trick. Or maybe you're not supposed to fill it with that many notebooks. One of the ways I stay organized is by using a different notebook for each of my clients or projects. This gives me a practical excuse to buy all the notebooks, but it also means that I sometimes have a lot of them to carry around. I fit all my current projects, plus my laptop and an A4 Rhodia pad, plus a 200-page spiral bound manuscript into this bag, and I didn't even use any of the interior pockets or any of the top or side pockets. It's very rare that I run out of work before I run out of bag space. Not on a bag without wheels. Even though I don't carry it every day, there are some things it's especially great for. -Day trips with the kids. This is the bag that will carry our adventure survival kit. It makes a phenomenal diaper bag, and diapers weigh less than notebooks. -Travel. With this many pockets, you'll know exactly where everything is, which will help minimize the blood loss to your brain as you spend less time painfully contorted, searching for your book mid-flight. -Work away from the office. I can fit everything I need for a full day's work in here. Several days, probably. What I'm carrying instead: -Tom Bihn Co-Pilot. Smaller, still has lots of pockets (and pen pockets), and comes in fun colors. I carry this every day. -Topo Designs Mountain Briefcase. Slightly smaller, but with far fewer pockets. Some of the main compartment is taken up by a bag-in-bag so I can get the pocket organization I require. The main advantage to this one is the backpack straps. Both of these, however, are considerably more expensive than the Nomadic. I'd put the Nomadic nearly in the same league as these bags, but at half the price. It can't boast the made-in-America provenance that the others can, but if you're looking for a great bag at a really good price, this one will delight you. Posted on November 10, 2016 by Sarah Read and filed under Nomadic, Bag Review. I’ve been on a pen case kick recently and have been looking for a flat case design where I could have direct, easy access to a few of my key pens with the ability to store them without taking up too much space. I wanted to be able to quickly locate a particular pen without having to fish around a pouch or container full of my other favorite pens. The Nomadic PN-04 Snap Button Case is exactly the type of case I was looking for that fits all of my criteria for having flat and easy access storage. The case is sturdy and flexible and flat enough to fit inside a file folder organizer and keeps everything from pens, pads of paper and other items perfectly organized. It’s portable and durable to carry all of your important documents and writing instruments. The case itself is made from a nice durable nylon fabric that has an appealing graph pattern on the outside. You would probably need something really sharp to damage this case since the fabric is rather strong. There is an appealing color contrast that helps to see all of your items clearly. I picked up the Khaki Green case which opens up to a light tan interior with pockets on both sides. The two zipper pockets on the front and side open up to nice bright orange. The color contrast helps to really highlight the pens to quickly see and find the exact pen you need. That, and I happen to just be a sucker for anything orange. If you have an aversion to velcro, then this case is right in your wheelhouse since it has none. The Nomadic case contains two zipper compartments; one in the front and another on the side. The front pocket is a good size for smaller items such as pen refills and extra eraser tips and lead. 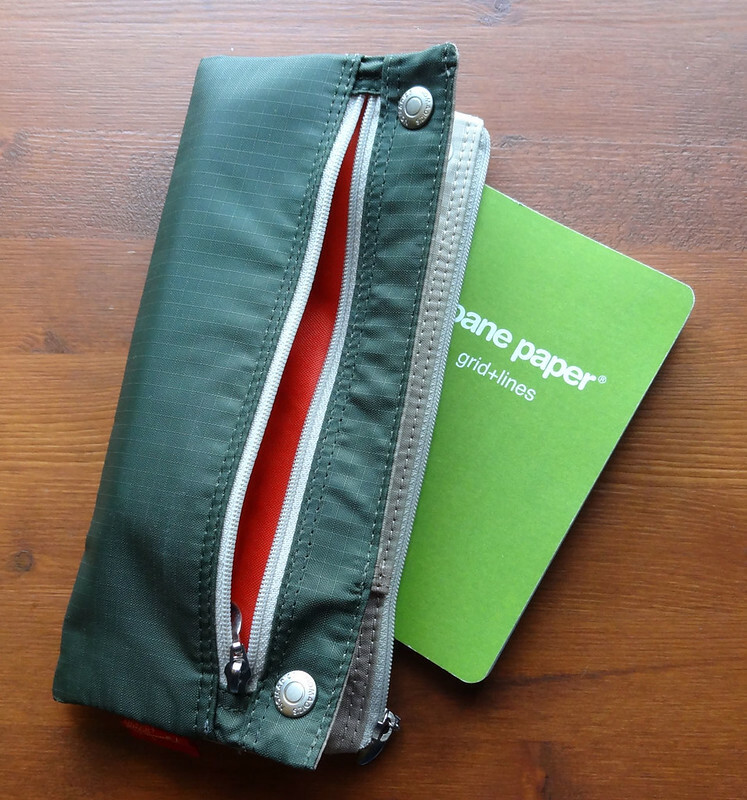 The back pocket is large enough to hold a pad of paper such as my favorite Doane Paper Utility Notebook 3.5 x 5.5 which fits perfect with enough room to zip up the pocket. The case is closed with two button snaps on each end of the case without any noisy velcro to pull off. When the case is opened, there are pockets on both sides that can be used for storing pens on each side by clipping unto the pocket. There is enough room on both sides of the pockets to fit about six to seven pens of standard size. The problem with the pockets is the fact that you are required to have a pen that has a clip to attach to the pockets. You can store a pen without a clip in one of the pockets but it might be rather difficult to find the pen you are looking for buried in the pocket. 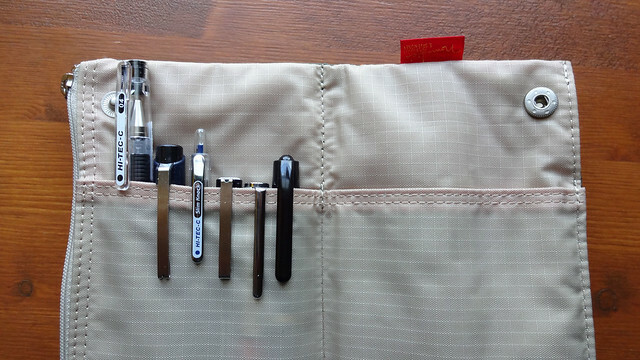 There is enough room in the front zipper pocket of the case to fit one or two smaller pens without clips. This way you can keep a few of these pens without clips secured in the zipper pocket without having to dig inside the case. While there are many features that highlight this case, there are a few small drawbacks as well. There are a limited amount of pens you can store before the case can become too bulky. Ideally, it’s best to only use one side of the case to store pens. Placing pens on both sides would not only cause the case to be too bulky but would cause the pens to rub against one another when the case is closed. For the collectors out there, this might be a big issue for any damage that might occur with the pens depending upon what kind of pens you're storing here. Another issue is how the button snaps expose the case by not totally enclosing it. There is a little bit of a gap around the case between the buttons when the case is closed. You could easily pop open the case if something gets caught in between the buttons depending upon how the case will be carried and travelled with. The strong nylon fabric is good for durability on the outside but I would have preferred a softer fabric for extra protection for each pen stored on the inside of the case. You can tell right away that this is a Japanese based case since it opens from left to right instead of the right to left. Nearly every time I pick up the case, I open it up the wrong way which is upside down. Thankfully my pens are clipped unto the pockets or they would just fall out. This is a really minor problem that can be worked around after several uses or you can just get into the habit of selecting a pen upside down. Minor issues aside, this is a great portable case for traveling without taking up too much space. This is perfect for carrying a few key pens without the need to carry a bulkier case. Its flat profile is ideal for file folders and portfolio storage. The Nomadic PN-04 snap button pencil case is recommend for anyone that travels and would like to carry a few select pens and paper for quick access and durable storage. Posted on December 4, 2012 by Brad Dowdy and filed under Pen Case, Nomadic.